Our drive to Turtuk was interesting but we could not see anything in Turtuk because we got very late, the destination today was to reach Pangong which was also a longish drive, so we decided to leave early. 5:50AM We left the hotel. 8:20 AM We arrived ar Hunder, we stopped for a while at Sand Dunes. 0930 AM We again stopped at River Side Resorts again hoping to get some breakfast but unfortunately, it was only Maggi. So we just stopped for tea. Finally we continued driving till Durbuk for food. The road turns worse from here onwards. Here are couple of samples of bad roads on this sector. 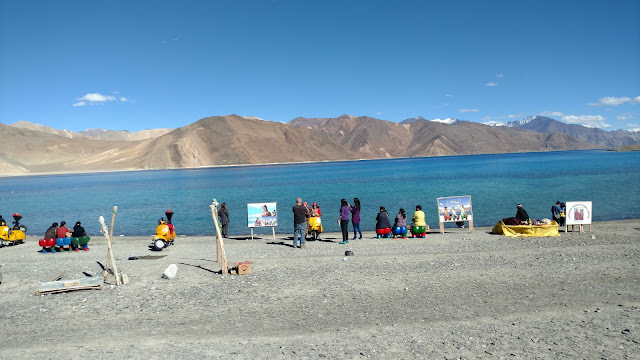 2:50 PM Finally arrived in Pangong Lake, as soon as you see the lake, you feel the trouble of getting there was worth it. 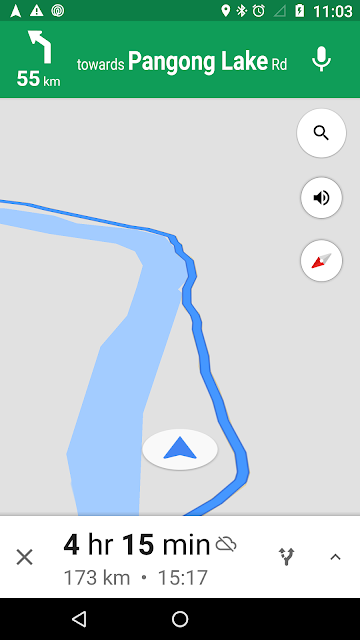 Finally, we drove towards Spangmik village, some 7-8 kilometers from starting point of the lake. Looked around and found some accommodation for the night. The season was just about to end, may accommodations were just closed.